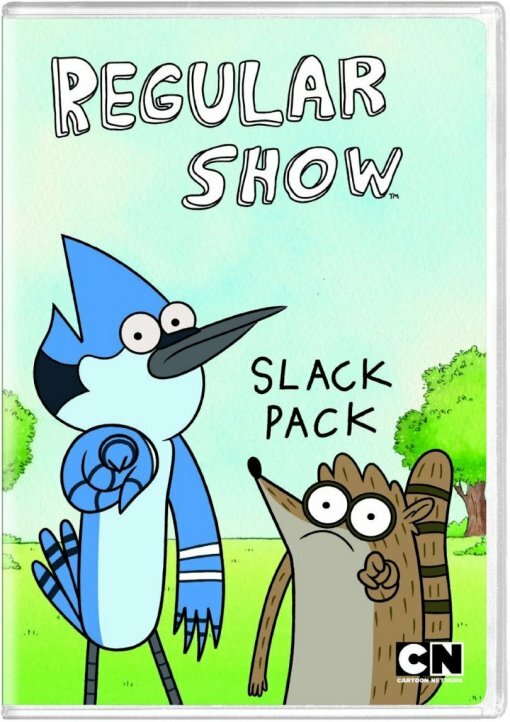 Enter to win The Regular Show “Slack Pack” DVD! Hey friends? You know who else loves to enter DVD contests? My Mom! If you got that joke, then you must be a fan of Cartoon Network’s Regular Show. If you didn’t get that joke, then let me take a minute to explain the joys of the Regular Show. The Regular Show follows the adventures of Mordecai (pronounced more-de-kai) and his sidekick Rigby, a pair of park groundskeepers who have a singular disdain for hard work, love annoying their boss (the gumball machine-like “Benson“) and frequently have encounters with aliens and/or creatures from another dimension. Their friends and co-workers around the park include the know-it-all Yeti “Skips” (voiced by an unrecognizable Mark Hamill), the clueless, yet charmingly anachronistic, “Pops,” the pot bellied, hot-tempered “Muscle Man,” and his partner and best friend “High Five Ghost,” (who, as you might expect, is a ghost with a perpetual high five appendage). Most (if not all) of the episodes have a pretty high absurdity quotient, but at the same time, despite their silliness, I find myself watching them over other shows in the DVR queue and recommending them to friends. If the Regular Show sounds like something you’d like to watch, then perhaps you’d like to win your very own copy of the Regular Show “Slack Pack” on DVD. You can enter this contest via the following entry form: www.bumpershine.com/regularshow. Contest is open to U.S. residents 18 or older. One entry per email address, one bonus entry awarded every time a friend enters through your shared Facebook link. Void where prohibited. Offer ends 05/04/12 at 11:59 PM ET. Cartoon Network Redefines “Regular” by debuting its hit animated comedy series Regular Show on DVD with the Launch of Regular Show Slack Pack. The Emmy nominated hit comedy (Outstanding Animated Program) has been part of the popular Monday night line up on Cartoon Network along with the hit show Adventure Time. Regular Show features Mordecai and Rigby, two groundskeepers at a park whose attempts to escape their everyday boredom take them to fantastical extremes. The job is so deadly dull that the two friends will do anything they can to avoid it. Regular Show Slack pack features 12 episodes from seasons 1 and 2. Watch some Regular Show clips after the jump. New Episodes Air Mondays at 8/7PM CT on Cartoon Network.